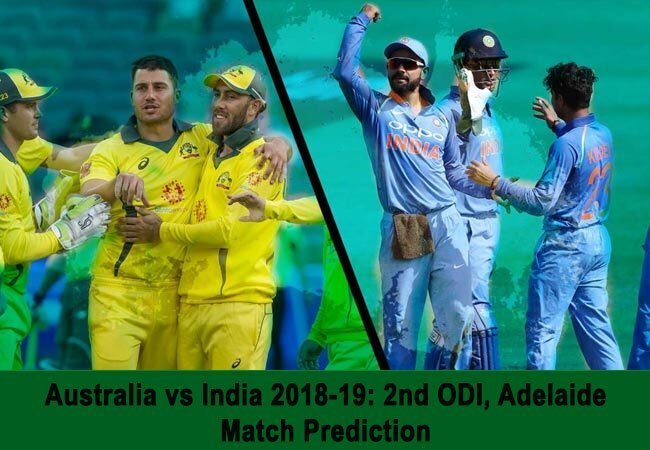 Australia vs India 2018-19: 2nd ODI, Adelaide: Kohli’s men will now look to bounce back when they take on the hosts in the second ODI at the Adelaide Oval in Adelaide on Tuesday, January 15. Both teams have played 119 ODIs against each other with the Aussies leading the head-to-head race by a 74-45 margin. In the five matches played at Adelaide, the visitors have emerged victorious on just one occasion. In their previous meeting at this venue in February 2012, after electing to bat first, the hosts were unable to put pressure on the tourists as they managed 269/8 in their quota of 50 overs. Gautam Gambhir helped India to win the game by four wickets. The Men in Blue went into this series on the back of 3-1 ODI series win against West Indies. The visitors continued with same enthusiasm from where they left off in that series and were very much in the game until the first half of the game. Though they had a disaster start to their reply losing first three wickets inside three overs. But with Rohit Sharma and MS Dhoni on the crease things were still in India’s favor. But things changed drastically in 33rd over as MS was given LBW of Behrendorff, which certainly proved to be a turning point of the game. Rohit Sharma struck a well constructed 133 runs in the first ODI against Australia. The opener has been in decent form since Asia Cup and will once again be their main weapon against the Aussies. MS Dhoni once again was their star performer in the middle with a steady half-century and former Skipper once again proved why he is considered as the master of cricket, who knows how to use different tactics for different situations. Except these two, India will also bank on the likes of skipper Virat Kohli, who didn’t have a memorable day in the first ODI outfit. He along with Shikhar Dhawan will be eager to make a mark in the second one. Khaleel Ahmad was quite expensive and failed to get any wicket in the previous match and one might see him make way for Yuzvendra Chahal or Siddharth Kaul in the next game. Kuldeep Yadav was the pick of the lot with figures of 2/54 and he will once again be their go-to man against the opponents. While Bhuvaneshwar Kumar too snared a couple of wickets and him along with Mohammad Shami and Ravindra Jadeja will be expected to rattle the opponents next time out. Virat Kohli (C), Rohit Sharma, Shikhar Dhawan, Dinesh Karthik, Ambati Rayudu/Kedar Jadhav, Ravindra Jadeja (AR), MS Dhoni (W), Bhuvneshwar Kumar, Kuldeep Yadav, Mohammad Shami, and Yuzvendra Chahal. The victory at Sydney was Australia’s third win in last 23 games and they will be much-relieved after the end of last game. They know that the series is not over yet and there are still a lot of areas which they need to polish before going into the next ODI. Peter Handscomb was the pick of the lot with his quickfire innings of 73 runs in 61 balls against India. His middle-order partner and all-rounder Marcus Stoinis hit 47 runs from 43 balls. Both these batsmen along with Shaun Marsh (54 runs from 70 balls) are the core of their middle order and are once again expected to cause problems for the Indian bowlers. The team will also bank on the likes of Alex Carey and Usman Khawaja, who have ignited a new hope in the camp and these two will be expected to make a path for the middle order to follow. Though their only concern was skipper Aaron Finch, who has not been in best of form in recent times and he will be eager to get back to form in the second ODI. Jhye Richardson was the pick of the bowlers in the first game with economical and career-best figures of 4/26 in four overs. He was well supported by Behrendorff and Marcus Stoinis who took 2/39 and 2/66 in ten overs respectively. These three will be expected to deliver in the upcoming fixture as well. Aaron Finch (C), Alex Carey (W), Usman Khawaja, Shaun Marsh, Peter Handscomb, Marcus Stoinis (AR), Glenn Maxwell, Nathan Lyon, Peter Siddle, Jhye Richardson, and Jason Behrendorff.